After I began to believe in the Lord, the brothers and sisters liked to sing a hymn called “Our Beloved Is Knocking at the Door” which goes: “Our beloved is knocking at the door, His hair wet with dew; let us quickly rise and open the door, and not let our beloved turn around and leave. …” Every time we started to sing this hymn, our hearts were deeply moved and stirred. We all wanted to ask our beloved to stay the night, and when He comes and knocks at the door, we wanted to be the first to hear His voice and welcome the Lord. You could say that all of us who believe in the Lord retain such a hope. But when the Lord comes, how will He knock at the door? When the Lord knocks, what should we do to welcome Him? This is something everyone who believes in the Lord should ponder deeply. When the Lord Jesus came to do the work of redemption in the Age of Grace, news of the miracles wrought by the Lord and the word of the Lord spread throughout the land of Judea. His name also caused a great stir in all the Jewish lands and, for the people of that time, the Lord Jesus leading His disciples to preach the gospel of the heavenly kingdom wherever they went was the Lord knocking at their door. The Lord Jesus said: “Repent: for the kingdom of heaven is at hand” (Matthew 4:17). The Lord hopes that people will come before Him to repent and confess their sins. In so doing, their sins will be absolved, and man will break free from the curse and condemnation of the law and be redeemed by God. At the time, many Jewish people witnessed the miracles performed by the Lord Jesus. They also noticed the authority and power in the word of the Lord, such that the Lord Jesus was able to feed 5,000 people with five loaves and two fish. With a single word, the Lord Jesus was also able to calm the wind and the sea, as well as to cause Lazarus to emerge from his tomb after being dead for four days…. Whatever the Lord Jesus spoke was accomplished and fulfilled, and this allows us to see the authority and power in the Lord’s word. The words the Lord Jesus used to teach people and the words He used to rebuke the Pharisees were the truth and were not words we human beings are capable of uttering. The words spoken by the Lord Jesus and the things He did revealed the disposition of God and what God has and is. They manifested the authority and power of God and caused men’s hearts to quake. It may be said that the Jewish people at that time had already heard the sound of the Lord knocking, but how did they treat the Lord? The Jewish priests, scribes and Pharisees at the time knew clearly that the words spoken by the Lord Jesus and the miracles He performed all came from God, but they did not at all have hearts that revered God. They did not seek or investigate the work of the Lord Jesus, but instead just clung blindly to the words of the biblical prophecies, believing that the one who was to come would be called Emmanuel or Messiah, and would be born of a virgin. When they saw that Mary had a husband, they concluded that the Lord Jesus was not the immaculate conception of the Holy Spirit, and that He was not born of a virgin. They also made arbitrary judgments and said that the Lord Jesus was the son of a carpenter and was just a completely ordinary person. They used these judgments to deny and condemn the Lord Jesus. They even went as far as to blaspheme against the Lord Jesus and say that He relied on Beelzebub, the ruler of the demons, to cast out demons. In the end, they colluded with the Roman government to crucify Him. Most Jewish people believed that the Lord Jesus should have been born in a palace, and that He would be their king and would lead them to throw off Roman rule. When the Pharisees were spreading rumors and slander and condemning the Lord Jesus, they were just being blindly obedient without any discernment at all. Between the salvation of the Lord Jesus and the slanderous words said by the Pharisees, they chose to listen to the falsehoods and outright lies of the Pharisees, and rejected the way preached by the Lord Jesus. When the Lord knocked on their door, they closed their hearts off to the Lord. It was just as the Lord Jesus said: “And in them is fulfilled the prophecy of Esaias, which said, By hearing you shall hear, and shall not understand; and seeing you shall see, and shall not perceive. For this people’s heart is waxed gross, and their ears are dull of hearing, and their eyes they have closed; lest at any time they should see with their eyes and hear with their ears, and should understand with their heart, and should be converted, and I should heal them” (Matthew 13:14–15). Because they refused to listen to the Lord’s voice and did not accept the Lord’s work of redemption, these Jewish people missed their chance to follow the Lord Jesus. As a result of resisting God, they met with God’s punishment, leading to two millennia of national subjugation for Israel. In contrast, the disciples who followed the Lord Jesus at the time, such as Peter, John, James, and Nathanael had hearts that loved the truth. They did not rely on their own notions and imaginings in how they treated the word and the work of the Lord Jesus, but sought conscientiously, studied them carefully and obtained the enlightenment of the Holy Spirit. They heard the voice of God and recognized that the Lord Jesus was the Messiah to come, and thus they kept pace with the footsteps of the Lord and received His salvation. We can see that the failure of the Pharisees and the Jewish people lay in the fact that they only relied on the literal meaning of biblical prophecies to understand and recognize the manifestation and work of God. This led them to be people who believed in God but resisted God. From this, we can see that, if people who believe in God treat God’s new work on the basis of their own notions and imaginings, not only will they not be able to welcome God’s arrival, but they will also very easily become people who believe in God and yet resist Him. How lamentable would that be? The Lord Jesus said: “Blessed are the poor in spirit: for theirs is the kingdom of heaven. … Blessed are they which do hunger and thirst after righteousness: for they shall be filled” (Matthew 5:3,6). We can see here that we can only welcome the Lord’s return if we can be like such people as Peter and John, have hearts that thirst and crave for righteousness when we hear the Lord’s voice, and actively seek and investigate it. Today, the prophecies of the Lord’s second coming in the last days have fundamentally been fulfilled. When the Lord comes again in the last days, we must be more vigilant and prepared, take heed of God’s voice, and have hearts that seek and thirst for righteousness to await the Lord’s knocking at our door, which could come at any time. Only in this way can we welcome the second coming of the Lord. The Lord Jesus said: “I have yet many things to say to you, but you cannot bear them now. However, when He, the Spirit of truth, is come, He will guide you into all truth” (John 16:12–13). And in chapters 2 and 3 of Revelation, it is prophesied many times that: “He that has an ear, let him hear what the Spirit says to the churches.” We see in the Bible that when the Lord Jesus returns, He will express His word and do new work. This is the Lord knocking at our door, and it is the Lord using His word to knock on the doors of our hearts. All who hear the words spoken by the Lord and actively seek and listen attentively to the voice of the Lord are the wise virgins. Once they recognize the Lord’s voice, they are then able to welcome the return of the Lord and accept the watering and supply of the word of God. This fulfills the word of God: “And also on the servants and on the handmaids in those days will I pour out My Spirit” (Joel 2:29). The Lord is faithful and He will surely allow all those who yearn for and seek Him to hear His voice in this time. However, God’s wisdom is difficult for us humans to fathom, and the way the Lord will knock at the door when He returns will not be as it seems in our notions and imaginings. It could be someone calling “the Lord has returned!” to us, just as the Lord Jesus warned us: “And at midnight there was a cry made, Behold, the bridegroom comes; go you out to meet him” (Matthew 25:6). We may also hear God’s voice from the churches that spread the gospel of the Lord’s return, or from the Internet, radio, Facebook, or elsewhere and see God speaking to all the churches. Still, no matter what way the Lord knocks on our door, we absolutely must not treat the Lord knocking at our door like the Jewish people did. We must not decline to seek or investigate His knocking based on our notions and imaginings, much less blindly listen to and believe lies and rumors. By doing so, we would be rejecting the Lord’s call and would miss our chance to welcome the Lord and be raised up into the heavenly kingdom. It is prophesied in Revelation: “Behold, I stand at the door, and knock: if any man hear My voice, and open the door, I will come in to him, and will sup with him, and he with Me” (Revelation 3:20). The Lord Jesus says: “Seek, and you shall find; knock, and it shall be opened to you” (Matthew 7:7). The will of the Lord is that we may all become the wise virgins and always be watchful in listening for the Lord’s voice. When we hear the Lord’s voice, we must look into it with open minds and investigate it earnestly, and when we recognize the voice of God, we must rush out to welcome the Lord. As long as we have hearts of seeking, God will surely open up our spiritual eyes. In this way, we will be able to be raised up before the throne of God and attend the feast of the Lamb! 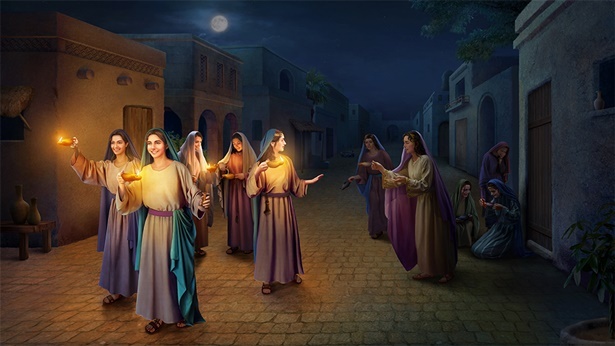 How the Prophecy of the Lord Jesus’ Return Is FulfilledWhen Will Jesus Return? 5 Prophecies Tell YouGospel Movie Clip "Yearning" (1) - So This Is How the Lord ReturnsGospel Movie Clip "Break the Spell" (1) - How Can We Welcome the Lord's Return?